And today is a Special day ... because it is also New Moon ... Therefore is a day when ... we need to honor the Lord but also we can clean our Sub-conscious. I am not full in accord with this because they consider that we Humans do not live in other planets before ... consider only the Cavern man ... and therefore is INCOMPLETE. Can you accept Humans live on Venus and Mars as well Maldek ... before Earth? What about to post the following questions ... Where comes from the Cyanobacteria? 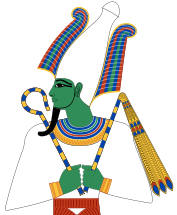 Osiris was a Green God (or Green Angel). The Sacrifice made by Osiris regards ... Our Green Inheritance ... because ... at the moment of the Ice Age ... there were no Humans alive ... and we comes from the Green Kingdom. is to re-fix ... Our Green Inheritance ... and previously was necessary to be removed ... read it in full here. Now ... Scientist must know ... and open ... a so-metaphysical true ... to understand well Bio-logy. When Genesis say ... Genesis 2:7. And the LORD God formed man of the dust of the ground, and breathed into his nostrils the breath of life; and man became a living soul. 8And the LORD God planted a garden eastward in Eden; and there he put the man whom he had formed. Unfortunately the National Geographic video do not speak about God ... and the creation of man. We Humans can absolutely accept God in the Creation and clean ... the bad measures and establish the correct true ... that is Scientific ... but Cosmic.